“A Northwest Language of Contact, Diplomacy, and Identity: Chinook Wawa / Chinook Jargon,” by Henry Zenk and Tony A. Johnson, appears in the new Winter 2010 issue of the Oregon Historical Quarterly. Although the article focuses on the use of the language in the treaty negotiations of the 1850s, it touches on its long-continued currency among some Indians, and on its somewhat distorted, even picaresque use by many Euro Americans for a period long beyond its real utility. 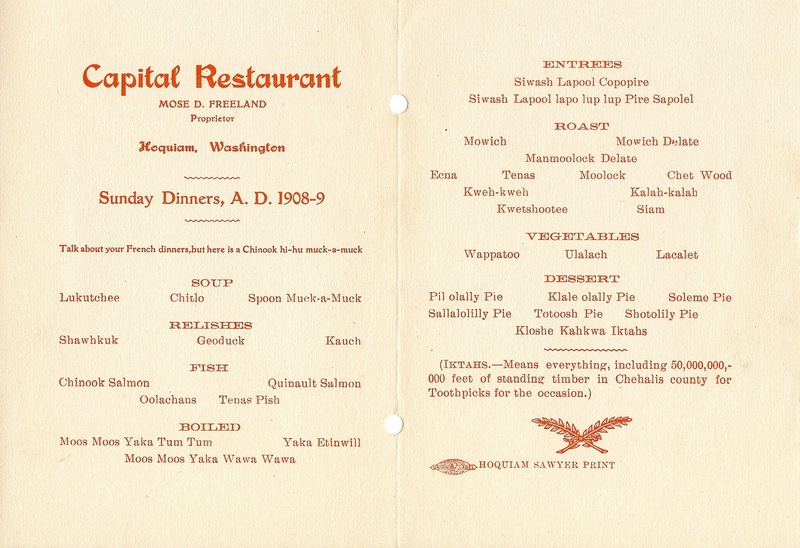 I recently acquired a menu from the Capital Restaurant, Hoquiam, Washington, captioned “Sunday Dinners, A.D. 1908-09”: “Talk about your French dinners, but here is a Chinook hi-hu muck-a-muck.” Most of the menu appears in Chinook Jargon or some twist on it, and part of the puzzle is to decipher what is intended by each menu entry. Another part of the puzzle is to understand why it was issued, when and by whom? Google led me to a piece in The Coast, a booster magazine issued out of Seattle from 1901 to 1911. In the July 1907 issue there is a short entry, “An Indian Bill of Fare,” which states that “It is due to Hoquiam,Wash., to produce the first and only known [Indian] bill of fare on record. The originator, Mose Freeland, is one of the old-timers of Grays Harbor, and runs a restaurant at Hoquiam.” There follows a copy of the menu text. The short piece immediately following the menu is titled “The Fish Remembered.” This is a humorous “fish story” about settler Dave Brown on the Wallacutt [now Wallacut] River, which is situated near Ilwaco, some sixty miles south of Hoquiam; it, too, is a contribution of Mose Freeland. Mose Freeland needs some research. But it is apparent that he had a sense of humor that he wished to share. 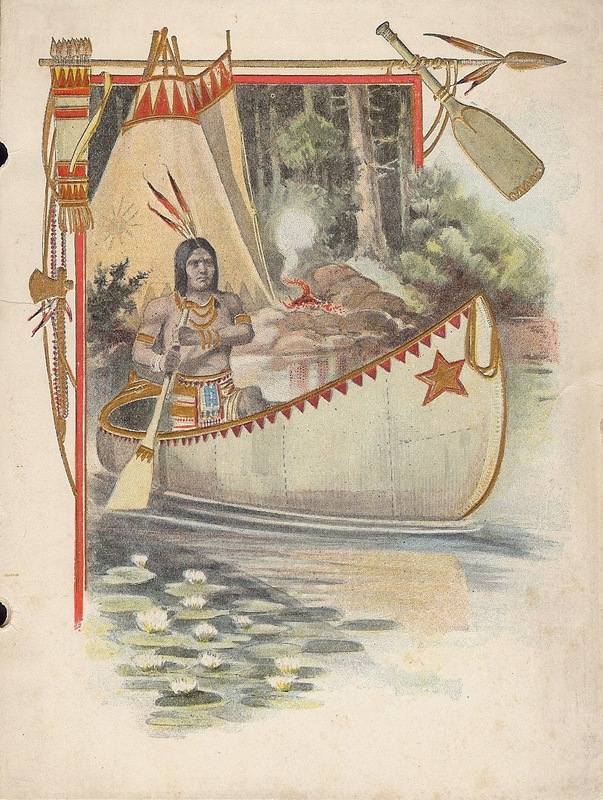 Granted some of that humor was at the expense of the Indian, reduced on the menu cover to a caricature of Longfellow’s caricaturistic Hiawatha, and implicitly made fun of in the menu entries. I have made a stab at translating some of these; a few are noted below. Some terms are verbal twists that elude my understanding. Any suggestions will be most welcome!